I like using the pre-printed panels (cutaparts) in the Greetings to Go kits to make cards. They often have a greeting and artwork right on them, so they just need a bit of embellishment. My top card uses embellished panels, and the bottom one a manila tag from my stash. Love the running horses stamp. I used Club Scrap sapphire, moss, and earth inks to get the collage effect. I had to look if the Greetings to Go pack is still available, and it is! Love these fall colors! 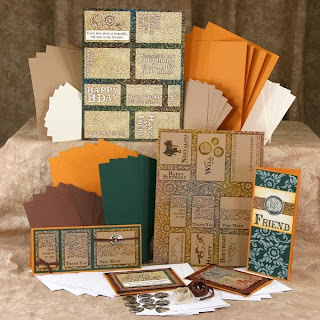 All Club Scrap's GTG packs come with card bases, panels, and envelopes to make 15 cards plus cutapart panels and embellishments. It's a great deal, and to have cards made with CS's quality cardstock is such a bonus. Thanks for taking a look at my entry. Hope you have a blessed week!